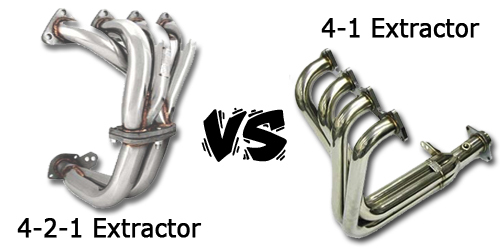 4-1 is for high end power and 4-2-1 is for lower end. For auto we always recommend 4-2-1 because your engine rpm cannot reach as high as manual. It will change gear about 7k rpm automatically for most of the car. Manual is different, you can rev until 9k rpm (depends on your car setup). When 9k rpm, a lot of exhaust gas will be generated. So, 4-1 is working good here. 4-1 has bad respond at low end because of back pressure from your muffler. Imagine your engine is running at 2-3k rpm, the pressure from outside the car is greater than your exhaust pressure generated by your engine. So, your engine will have extra burden now. You will feel more heavier to drive ur car, then u will press harder on accelerator. At last, end up burn more fuel. 4-2-1 is reverse theory. It can give higher pressure at low rpm to push the exhaust gas out from the car. Conclusion: a 4-1 will give move the powerband towards higher regions, suitable for high-revving engines while 4-2-1 give a broader powerband, punchier low-end and mid.